Too often, towels tend to be the unappreciated workhorse of the linen world. They are such a part of our daily lives that we often use them without much regard and take them for granted until they fall apart, or we suddenly realize that guests are coming and it’s time for a spruce up! While there is a dizzying assortment of towels available, knowing what you’re looking for will make shopping easier, and will help you put together a towel wardrobe that will be both stylish and practical. Wash new towels before using to remove any chemicals and dirt from the manufacturing and shipping process. Wash towels after every three uses to ensure freshness. Don’t use liquid fabric softener, as it reduces absorbency. Vinegar in the wash cycle can help increase absorbency and remove any musty odor if towels were damp for too long. Dry towels thoroughly to avoid mildew, but be careful not to overdry them, as this can break down fibers faster. When making your shopping list for towels, first consider your needs. How many people will use these towels? Where will they be used—in the master bath, for the kids, in the powder room, at the beach? How often will they be used? These considerations will affect everything from style to size to quantity, so know what you need before you shop. Egyptian: If you want towels that feel sumptuous and last, Egyptian towels have long been the standard. Made from extralong fibers, “true” Egyptian cotton is high quality, fluffy, and absorbent. Egyptian cotton produced outside of Egypt can be of varying caliber, so if you want premium quality, check the label for a black triangular seal from the Egyptian government, and be prepared to pay accordingly. And, due to their absorbency and density, make sure that these towels are allowed to dry properly after use. Pima: Pima is grown in the southwestern United States, and is actually the same plant as the cotton grown in Egypt, so it will have a similar feel and absorbency to Egyptian cotton. It’s known for its soft weave. Supima® towels are touted as being made from extra-long Pima cotton fibers, so you should expect superior feel and quality when purchasing towels with this label. Turkish: Turkish towels tend to have slightly shorter fibers than Egyptian cotton (though highdensity Turkish towels can actually be thicker and fluffier than Egyptian ones.) These fibers will dry more efficiently while still providing softness and absorbency, so they’re well-suited to humid environments. Bamboo: Bamboo or bamboo-cotton blends are a new trend in towels and are growing in popularity. Besides being soft and absorbent, bamboo is an ecofriendly choice due to its sustainability and lack of pesticide use. It’s also naturally anti-bacterial and color-fast. Organic cotton: Certified organic cotton towels are sustainably produced and pesticide free, and their smaller carbon footprint makes them an attractive ecological alternative. A good rule of thumb is have two bath towels, two hand towels, and two washcloths per person. This allows you to keep one set in use while the other is in the laundry. If you like a generously-sized towel, consider upgrading your bath towels to bath sheets, which have a few extra inches of width and length. For beach or pool towels, count on one per person, and add a couple extras to the stack to have plenty for a day on the water. While fluffy, pure white towels are timeless and provide a posh, spa-like feel, it can be fun to mix it up a little. An unexpected accent color, bold pattern, or stylish trim can look great in a powder room or kids’ bathroom. Like accent pillows, towels can also be swapped out seasonally, allowing you to enjoy bright colors in warm months, and richer or muted tones in cooler months, if you so desire. With warm weather on the way and lake and beach trips on the horizon, now is a good time to stock up on beach towels, but it’s always a good time to invest in bathroom linens. 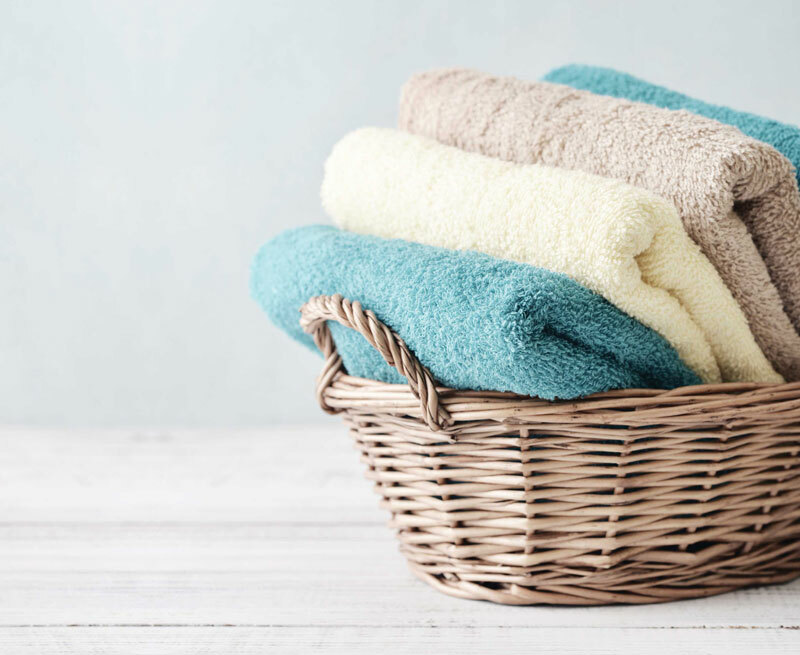 Purchasing a quality towel wardrobe will bring you pleasure every time you use them, because nothing beats stepping out of the shower and into a soft, fluffy towel!